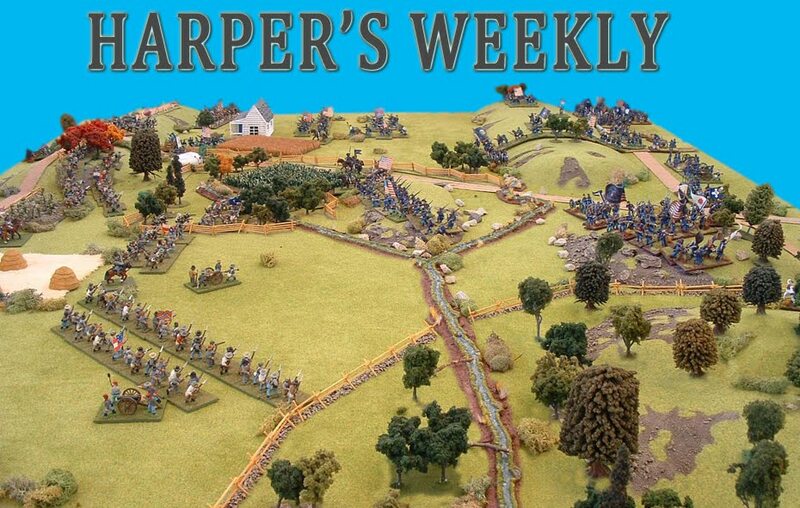 Harper's Weekly: The Journey begins. 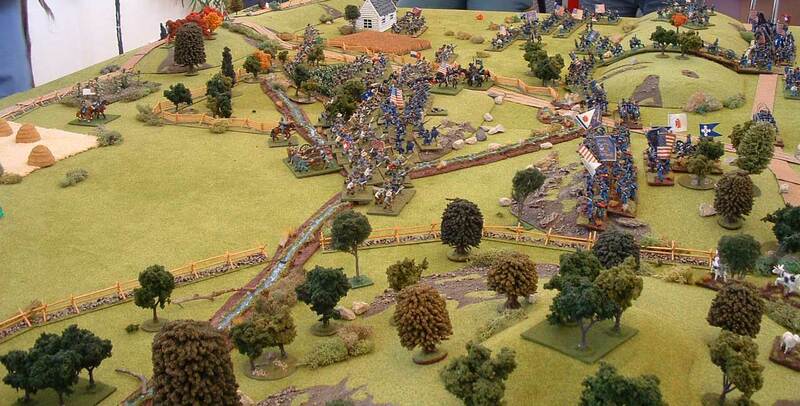 July 1st 2013 will be a special day to many Americans and Civil War afficianados alike. It was on this day 150 years ago that cavalry units of the Union Army of the Potomac encountered the lead elements of General Lees Confederate Army of Northern Virginia at the town of Gettysburg, Pennsylvania. Over the following three days an epic and bloody struggle ensued that has become immortalised as The Battle of Gettysburg. Described by some as the ‘High tide of the Confederacy’ due to the seemingly endless previous string of Confederate victories and the invincible reputation of its Commander Robert E Lee. General Lee planned to inflict a decisive blow to the Union Army deep inside Union territory to weaken the resolve of the Northern States to continue the conflict and gain support from Britain. Lee at this stage of the conflict commanded some of the most aggressive, battle hardened veterans, full of confidence in their martial prowess, their commanders and an almost God-like adulation of ‘Bobby Lee’. It is claimed that at no time since this battle did the Confederacy regain the initiative and despite some outstanding victories their star never gained the ascendency. With hindsight we can see it must have been a massive reality check for the South. It should be remembered that the toll on both sides combined was 7863 killed and 27,224 wounded. The fact that it took over two months to bury the dead and clear the field bears testimony to the sacrifice these men made. 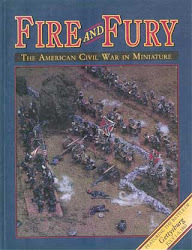 It is in honour of that sacrifice that the Southern Strategists have chosen to commemorate this Battle with a Refight of the 2nd and 3rd days in 28mm scale using the excellent Fire and Fury Rules and Scenario notes. Inspired by a hugely successful Borodino refight that a number of talented New Zealand gamers staged in September in Christchurch we plan to make this event both memorable and fun. 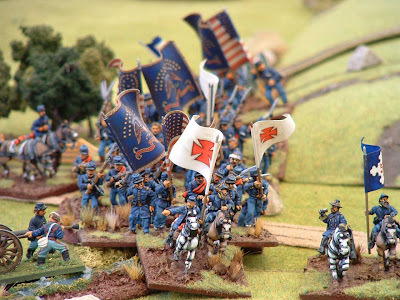 So ‘Rally to the flag boys’ and keep your eye on events as they unfold on this blog devoted solely to the Gettysburg Refight 2013. The photos below are from a demo game of the fight for the Round Tops we played a few years ago. 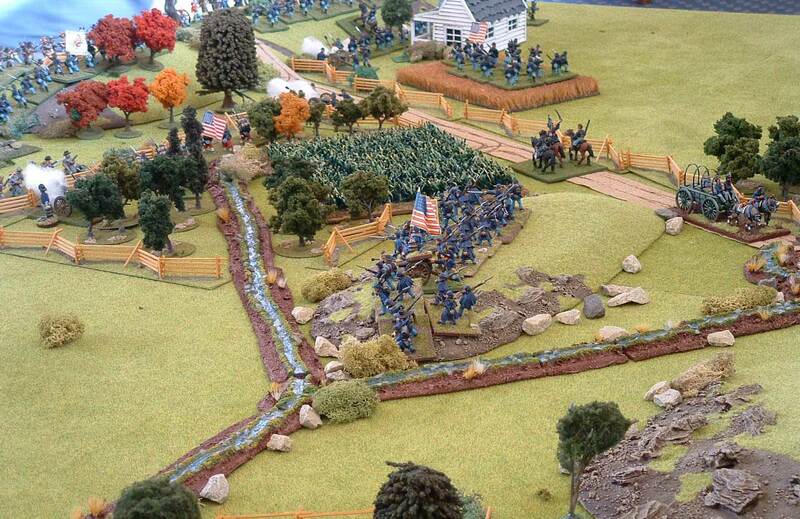 Here are a few very interesting facts from the battle of Gettysburg. The Confederate wagon train of wounded sent back to Virginia after the battle was 17 miles long. More than 3,000 horses were killed at Gettysburg. Lydia Lyster, who owned the small farmhouse used by George Meade as his headquarters, found 17 dead horses in her yard. Her only compensation for the extensive damage to her property was selling their bones at a half cent per pound. 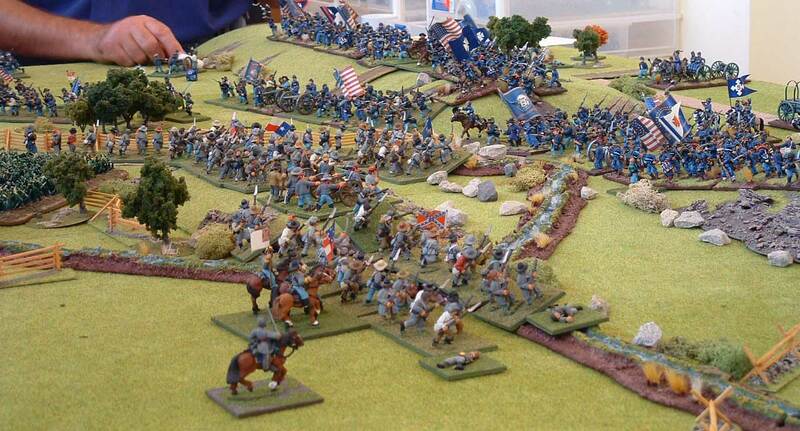 After the battle the army paid 13 cents per pound for lead gathered by Gettysburg civilians. After a boy was killed trying to pound open an artillery shell to get the lead pellets out the army refused to accept lead from children under 18. Off to a cracking start with your blog Rodg. Nice work. You'll need to add a few more players to the count: Chris P, Jonathon F, Andy T, Martin W and Tim D- and that is without the Wellington contingent- all are starting forces. I take it we are only counting new units raised for this event. Great idea guys. Looking forward to following this blog. 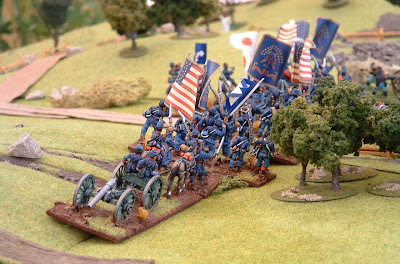 I won't be able to start painting anything till xmas,but with some luck the Perrys new Rebs will be out by then. Very much looking forward to following this project. Best of luck for it. Those pics look eye watering - I'd be keen to join in if you let me know what I need to contribute. 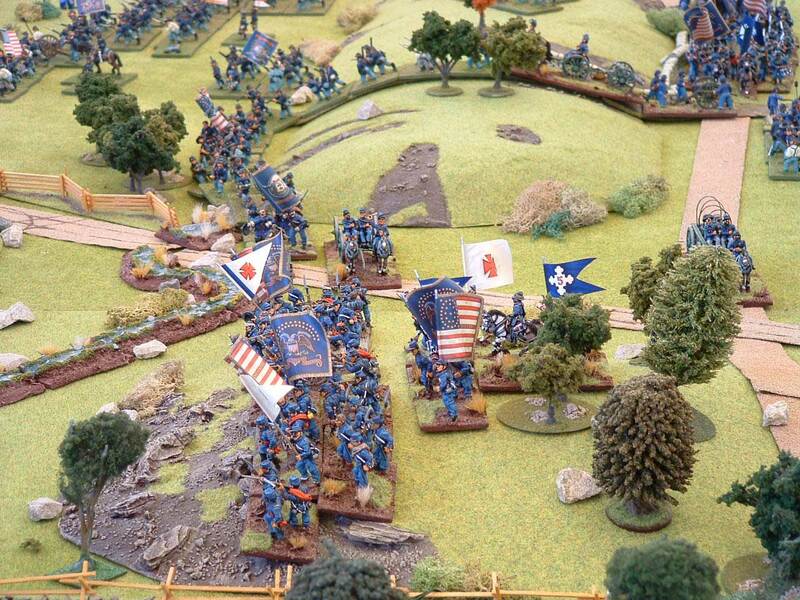 Don't have to contribute but if you want an excuse to paint up some 28mm ACW then here it is. I'm picking there will be spare fig's that will need commanders for them. An exciting project and fantastic table btw! Great and very interessting. Looking forward to the next steps. Good luck with the project Rodger. Will be fun to follow. We do the same project for a refight here so our group gets back to painting ACW in January. Nice firstpost as well! 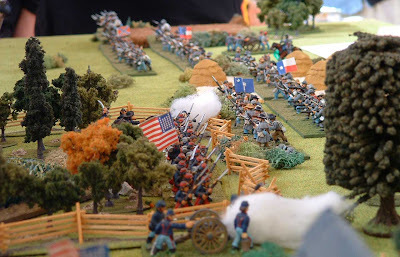 Just been on the Perry Miniatures website. I see you can get a Division Deal (6 boxes of plastics, 3 guns and 2 generals) for NZ$158 inc. P&P. That is crazy cheap! Paul, already done that deal. It is good! That's it, I had time to watch, and I am not disappointed! Great pictures with exceptional figures! Bravo!